I spent today in the polytunnel getting ready for the 2017 growing season. This year I’m going to try growing a variety of sweet peppers. I grew some last year which were quite sucessful but I didn’t really have enough space for them and I didn’t start them early enough so we only had a small harvest. 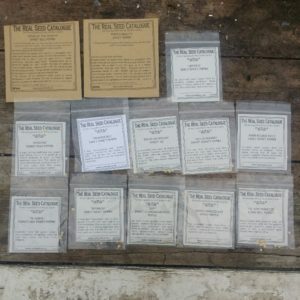 I’ve bought 13 different varieties this year, all from the Real Seed company. Sweet peppers need to be planted in January / February so they have a long enough growing season but they also need a temperature of about 25 C to germinate. 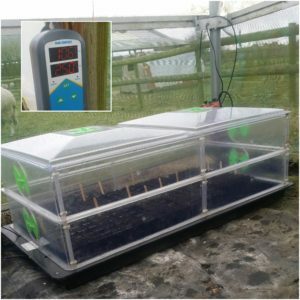 Fortunately I have a heated propagator which is very useful for getting everything germinating early. Last year I grew my sweet peppers in the raised bed in the polytunnel. This year I’m going to grow them in pots in a hot bed. We’ve made our first hot bed using an easy reach raised bed kit from Solway recycling and a large amount of muck from mucking out the pigs & chickens together with some fresh horse muck from the field and chipped prunnings. The beds are 62cm high and 122cm square which should be big enough to generate a decent amount of heat. 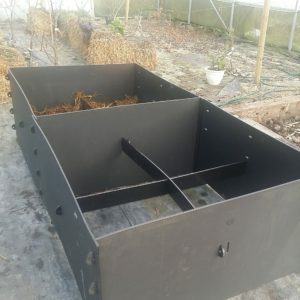 When growing in hot beds you can simply put a shallow soil layer on top of all the muck but I want to experiment with putting pots in the bed so I can easily move plants and also top up the bed when I need to. Once the bed is full I’m going to cover the top with a weed suppressant membrane and then cut holes for the pots which will be embedded in the muck. I’ve got a soil thermometer so I can monitor how hot the bed gets. The muck in the hot bed will rot down over the next few months but we’ll always have some to add and then at the end of the growimg season I’ll empty the hot beds onto the raised bed and soil beds in the polytunnel to continue improving the soil. Here’s a picture of the sweet pepper seeds I’m growing, my Vitopod heated propagator and the hot beds in constructions. The other task for today was potting up some Blueberry plants that I’ve bought. I have a couple of Blueberry Sunshine Blue. Blueberries need acidic soil so I’m going to grow them in large pots in the polytunnel rather than in the ground. 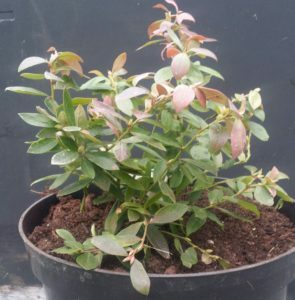 As well as the Sunshine Blue variety I’ve also got three Blueberry Top Hat which is a dwarf variety growing to a height of 50cm when mature. I’ll start the Top Hat blueberry bushes off in the polytunnel then move them to our front porch area in the Summer. Another year at Hooters Hall has ended and we’ve been here five years now. We’ve done a lot in those five years but there’s still a lot to do. 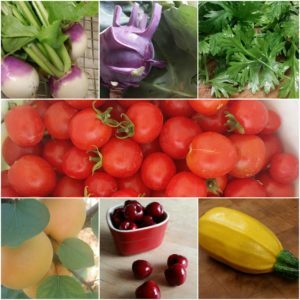 In 2016 we were able to spend more time growing our own produce and our experiment with straw bale gardening was very sucessful. The fruit trees, particularly the apricots were very productive and my squash forest gave us 75 winter squash which should see us all the way through the winter. The straw bales we used are still intact and I think they will do a second growing season. I’ve still got some red cabbage and spring onions growing in them. 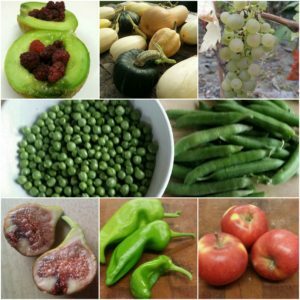 Looking back on our harvest for 2016 and making plans for 2017 I’m going to be growing more elephant garlic, spring onions, sweet peppers and melons. I think I’ll skip the Kohl rabi for 2017 it grew really well but there’s only so much you can eat. The same with turnips. I had early success with baby turnips, got a bit carried away and we had a bit of a turnip glut. Fortunately the pigs helped us out with that. I’m also going have a year off growing peas and beans. They are nice but there’s only so much room in the polytunnel and I want to try some different growing challenges. One of the best growing experiences of 2016 was harvesting fresh, homegrown melons and raspberries from the polytunnel for my breakfast. The tomatoes did really well this year too and although we had a bit of a glut it wasn’t overwhelming because we made good use of our dehydrator which means we’re still enjoying our tomato harvest now. At the end of the season we had a lot of green tomatoes and they made a really nice chutney. When we first moved to Hooters Hall five years ago I thought I might like to take up knitting but I remember telling a friend I didn’t think I would get into spinning my own yarn or any other fibre crafts. How wrong I was. I’ve got two spinning wheels and several weaving looms now and we’ve turned one of the rooms in the piggery into a fibre processing room. My super chunky handspun yarn is proving very popular in USA as well as UK and hopefully there will be a lot more fibre craft to come in 2017. 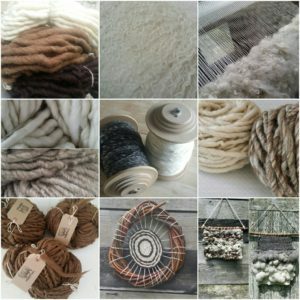 Here’s some pictures for the yarn lovers. The fibre we process at Hooters Hall is our own Jacob wool and mohair from our Angora goats. The sheep did really well in 2016. All but one of our ewes had twins and they are all thriving. We had a much earlier lambing than previous years because we kept our ram in with the flock from Summer through the autumn. February lambing did work quite well the lambs got to enjoy the best of the Spring /Summer grass and have grown really well with lovely fleeces. We moved each ewe inside when she lambed and kept ewes and the lambs inside for a few days before returning them to the flock We have had predator attacks over the past 5 years and learnt through experience it’s better to keep the lambs inside for the first few days. Unfortunately Amber our Angora doe didn’t fall pregnant this year but fingers crossed for 2017. We did add another goat breed to our herd with the arrival of Jen the Bagot goat. She’s doing really well and is now quite happy to eat out of my hand and even sits on my lap. Here’s some pictures of some of the other residents of Hooters Hall in 2016 including Big cockerel one of our first batch of home hatched chickens. If you follow Hooters Hall on Instagram or facebook you’ll have seen some of my natural dye experiments throughout 2016. 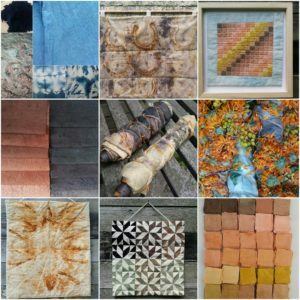 I’ve tried some rust dyeing using rusty objects found on the farm as well as some eco printing using foraged plant material and dyeing with botanical dyes that I’ve grown in my dye garden. In Spring and Summer we sell freshly harvested hedgerow dyes in the Hooters Hall farm shop. I’ve already posted pictures of the results of willow dyeing and in 2017 I’ll be showing what the other hedgerow dyes can do. Here’s s selection of my natural dye and eco print experiments on cotton. In the five years that we’ve been at Hooters Hall we’ve really got into outdoor cooking. 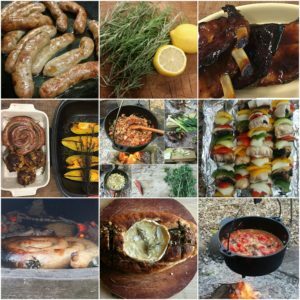 In the Summer, weather permitting, we’ll generally cook on the campfire enjoying our own Gloucestershire Old Spot pork with herbs and vegetables from the garden and polytunnel. We’ve shared a few recipes on our facebook page and there’ll be more to come in 2017. We’re going to be exploring the world of herbal syrups and I’m sure there will be more sausage and pork recipes. Before we moved to Hooters Hall we lived in South London. I loved living in London but you can’t beat Fenland for big skies and beautiful sunsets. Also the dark winter days are more bearable when you can watch the sun rise while doing the morning feed. 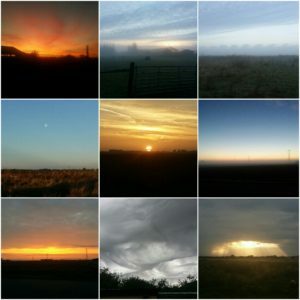 Here are some of the best big skies of the Fens from 2016. We spent our New year’s bank holiday doing a bit of polytunnel maintenance so now I’m itching to get growing again and it’s definitely time to start browsing the seed catalogues. We might be lambing again in a few weeks as well so keep an eye on our facebook and instagram for cute lamb pictures. You may have noticed that I’ve not been posting as frequently as usual lately. Well there is a very good reason, we’ve been busy organising our move from a back garden smallholding in South London to a 6.2 acre smallholding in Lincolnshire ! I’ll still be smallholding in the city because I’m going to carry on working in London. 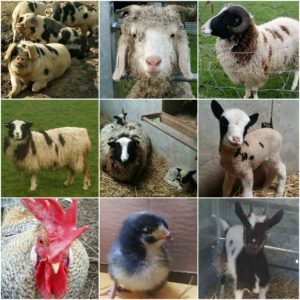 We plan to have a variety of rare breed pigs, some soay sheep, a lot more chickens and hopefully a suffolk punch or shire horse. We’re also planning to have our own butchery and cutting room and grow plenty of native plants. We’ll be keeping you up to date with everything and be posting plenty of videos as well as pictures. 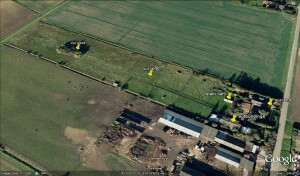 Here’s an aerial view of the smallholding, as you can see we’ve got a small wood and quite a few outbuildings as well as a static caravan. We’ll be without internet for a few days but as soon as we’re back online we’ll give you a tour.